US Navy units include the Harry S. Truman Carrier Strike Group (HSTCSG) with the carrier, a cruiser, and four destroyers and the Iwo Jima Amphibious Ready Group (ARG), USS Iwo Jima (LHD-7), USS New York (LPD-21) and USS Gunston Hall (LSD-44). 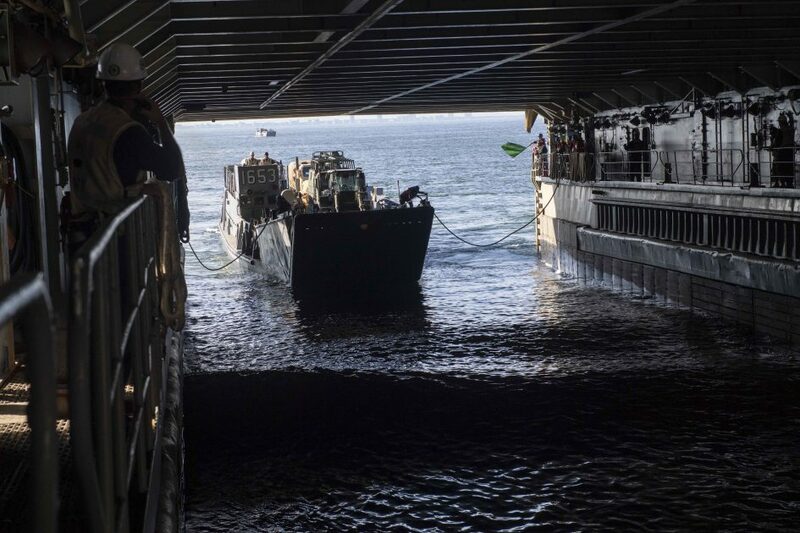 A landing craft utilities (LCU) enters the well deck of the Whidbey Island-class dock landing ship USS Gunston Hall (LSD 44) on Oct, 3, 2018, to embark on the ship for Trident Juncture 2018. US Navy photo. Apparently Gunston Hall experienced some minor injuries and damage. But now we hear from the poor victims in Iceland. 7000 sailors and marines invaded the town of Reykjavik (population about 125,000) and drank all their beer. This entry was posted in Arctic, Europe, Exercise by Chuck Hill. Bookmark the permalink. If they land in Canada, they would drink Canada Dry.